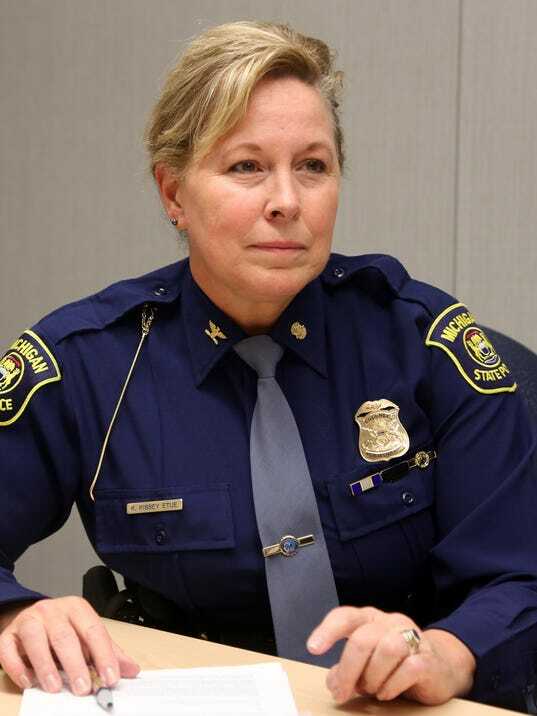 Michigan State Police director's NFL protest post tells us who she ... - We Resist. I suppose we should thank Col. Kriste Kibbey Etue. The Michigan State Police Director’s ill-advised Facebook post — sharing a meme condemning, in pretty crass terms, the protests by some NFL players against police brutality — just showed us what was there all along. The protesting players, who take a knee during the National Anthem, customarily played before sporting events, are “millionaire ingrates who hate America and disrespect our armed forces and veterans” and “a bunch of rich, entitled, arrogant, ungrateful, anti-American degenerates.” After the Free Press reported the post Tuesday night, Etue apologized for the post, which is in clear violation of the state police social media policy. The damage, however, is done. Kneeling is an inherently respectful act, an act of submission and veneration throughout all of human history. Colin Kaepernick and other NFL players aren’t turning their backs on the flag, or using derisive gestures to mock it. Kaepernick — who has said that he feels compelled to use his position to call attention to the police violence that disproportionately impacts black men — explained to ESPN that he devised this protest after consultation with a former Green Beret, who suggested that taking a knee would be respectful protest. It’s shoddy political gamesmanship to tie the players’ reasoned, respectful protest to disrespect for veterans, who serve our country for the ideals it embodies — like the right to political protest — not a piece of fabric, and many of whom have clearly and loudly defended the NFL players’ right to protest. It is possible to disapprove of the manner in which NFL players have chosen to protest. But to deny their right to make that protest is to profoundly misunderstand America. The Michigan State Police are present in nearly every Michigan community. In some, they’re first responders, the first law enforcement agency called to the scene of an accident or a crime. For the leader of that state police organization to call those protesting police brutality, most of whom are African Americans, “degenerates” is breathtaking, even if you don’t take into account that the state police have recently been heavily criticized following the death of an African-American teen hit with a Taser by a state trooper. For a white woman to imply that black men or anyone who holds a political position she doesn’t agree with “hate America” says clearly that to Etue, America is us, not them. For any public servant to delineate whom she feels merits citizenship, and respect and the rights that status confers, is a dereliction of duty. When you decide who does and doesn’t deserve the right to speech, who can and can’t object to mistreatment, who is and isn’t entitled to claim this country, you decide who has value. If degenerate NFL players hate America, they must not be very American — and that’s the kind of conclusion that clears the way for the assumption that “they,” those non-Americans, are maybe not quite as entitled to the rights recognized in us all by our founding documents. When your troopers pull a black man over, and he sits in the driver’s seat, white-knuckling the wheel in fear that a nervous cop will see his hands as a threat, terrified that this is the night he loses his life — and when your officer approaches that car, fearful because he knows that the man inside sees him as a threat — it’s because of people like you. When an officer sees a black teenager with a fake gun as disposable — as an animal best put down, than treated with the dignity and respect any human should command — it’s because of people like you. Thank you for telling us who you are. And, like Maya Angelou advises — we believe you. Next Could Nungesser protest hurt Louisiana tourism?